My daughter, her husband, and son came to visit me today. They live in Orange County and because of her working hours it has been difficult for them to visit for more than a day at a time. Lynn is my middle daughter who checks on me daily to make sure I am ok.
Because it has been more than 6 months since they have been here, I asked both of my other daughters and their families to join us. My oldest daughter was baby-sitting her grandchildren and could not make it. My youngest came with her family, and the two students I have living with me joined us as well, totaling twelve as we sat down for dinner. It was a fun evening, and we began talking about what we would do the following day. 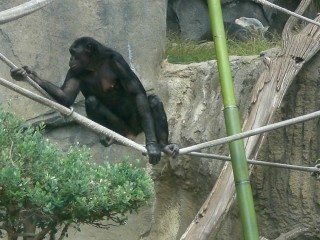 My grandson Zac did not remember ever going to the San Diego Zoo and thought it would be a fun thing to do, so I found a coupon for $5 off each person, limit of 6 – there were 4 of us – and we headed to the San Diego Zoo on a Friday, an overcast nice day. Our first surprise was the price of admission. With our $20 discount the cost was still $148. It included the guided tour, the express bus and the safari aerial tramway. When we went through the ticket booth, our hands were stamped so show that we had paid and would be allowed to take the bus and tramway free. (Upon returning home and while writing this article, I checked on something my daughter said to me – “. . . . why do they have to stamp your hand? We could not have purchased a ticket for entry into the Zoo alone. EVERYONE purchasing a ticket is entitled to the rides. She is correct. The only ticket for a 1 day pass is the one we purchased and we could not have purchased a zoo entry alone. )” The ticket seller told me that the $42, with the discount was less expensive than the senior citizen price. Our first stop was to the guided tour bus. I remembered how large the surroundings of the zoo were, and there have been many changes since I was there last, so I suggested we find out where the animals were housed and go to those that we wanted to see. That is what we did, except before we could ever get in line, we had to have our picture taken, then given a card to give to the “nice lady at the start of the ride.” When I asked her what that was for she said it would be printed up and we could see it after the tour was over. I asked her if we had to buy it and she answered “no”. The ticket said that it could be posted to Face Book and I asked if we had to purchase anything for that to happen. She said “no” but that it was a ‘super-small” picture that might be hard to see. It wasn’t that it was “hard to see” – I couldn’t figure out how to transfer it to Face Book. Then we waited in line for close to 25 minutes before we got on the bus. Our tour guide “Jonah” did a nice job in introducing us to the zoo. He was witty, informative, and asked questions that the riders tried to answer. Our problem was that we were on the top deck and the crowd on the bottom deck were able to joke with him: I wished we were on the bottom deck because they seemed to be having so much fun. There was one small chuckle for those of us with “dirty minds.” He said there was only one way to tell the difference between a male and/or female Indian elephant. “How do you tell the difference?” It certainly wasn’t what we anticipated the answer to be. (Or perhaps what you didn’t think the answer might be.) The size of the……………………………tusks, reader, tusks! That’s what determines the difference between the male and female elephant. (?)) The tour bus was well worth the money. Oh Yeah! It was free, all part of the admission. It was still free. When we got off the bus, waiting for us at the exit, were the packets of pictures that had been taken when we first stood in line to board the bus. They were nicely done; looked good, but the least expensive packet was $30. There were other choices too, ranging upwards of $40. After being there for several hours, my son-in-law and grandson were hungry. They thought they would buy some chips to munch on while we continued to view the animals. However, the small package of chips was $3.75 and they elected not to purchase them. About an hour later, the hunger pangs were active again, and we stopped at one of the restaurants to see about grabbing something to eat. The prices were exorbitant – and we, once again elected to wait longer. 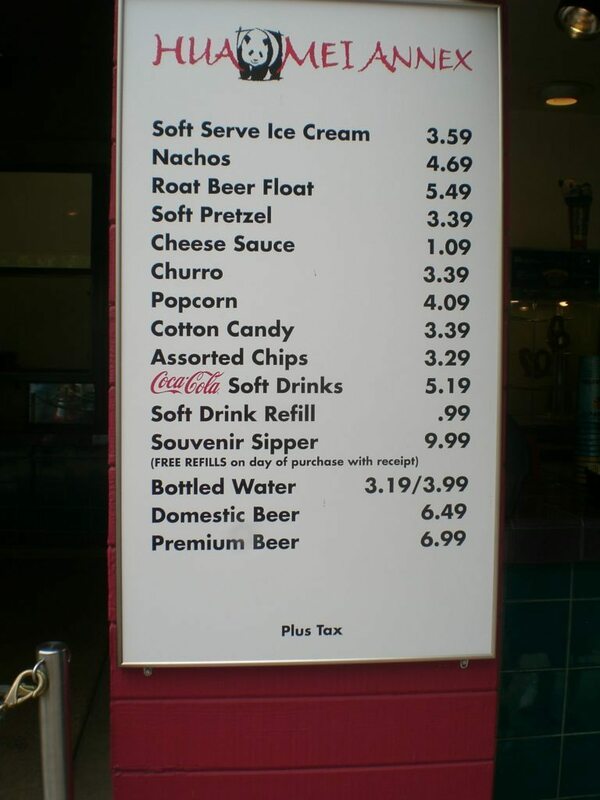 (See menu). BTW – the menu is only for the “munchies”. The one for the meals was ridiculously high. One of the amusing thing to me – and by now you know that I have a macabre sense of humor – was the sign for the “ATM” machine. I am used to see $$$ telling me how expensive a restaurant, a hotel, etc., might be. Look at the picture of the ATM. I wonder if the fees for using it were enormous. We continued our visit and decided that the last group of animals we would see would be the Orangutans. We thought it would be less expensive to eat at a restaurant outside of the zoo premises. Which is exactly what we did. However, we figured out that if we were a family of 4, admission at the standard price, food and drink also, it could easily cost close to $350. I don’t know about you, but I think it is pretty steep for a young family. I wonder if there would be more visitors to the zoo if prices were lower? True, you don’t have to pay for parking, and you no longer have to pay for the buses, but ee-gads! Three hundred and fifty dollars to have a family outing! Was it worth it? It was fun being with my family. But we might have had as much fun “People Watching” at the beach. « Welcome to the San Diego Free Press ! 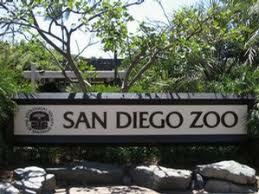 WOW…I live in Phoenix Arizona…But was born in Ocean Beach,San Diego…So I love San Diego..! !…That said….Here in Phoenix you can go to the Phoenix Zoo ….for Adult’s its $ 18.00 and for Kids its 3-12 it’s $9.00…Not much more to say…!!! I have wonderful memories of visiting the zoo. In the late 70’s we could wend our way through a group of trees by the botanical gardens & come to a chain link fence. Within seconds we could clamber up the tree, swing over the barbed wire, & drop to the ground. Scamper up the drive & blend in. We would always splurge after sneaking in & have a nice lunch at one of the restaurants. Sometimes during the summer we would visit a couple times a month. I could probably get in the same way nowadays; it would just be a bit harder to get the walker through the branches & over the barbed wire.